Leucosolenia botryoides, photographed by Bernard Picton. 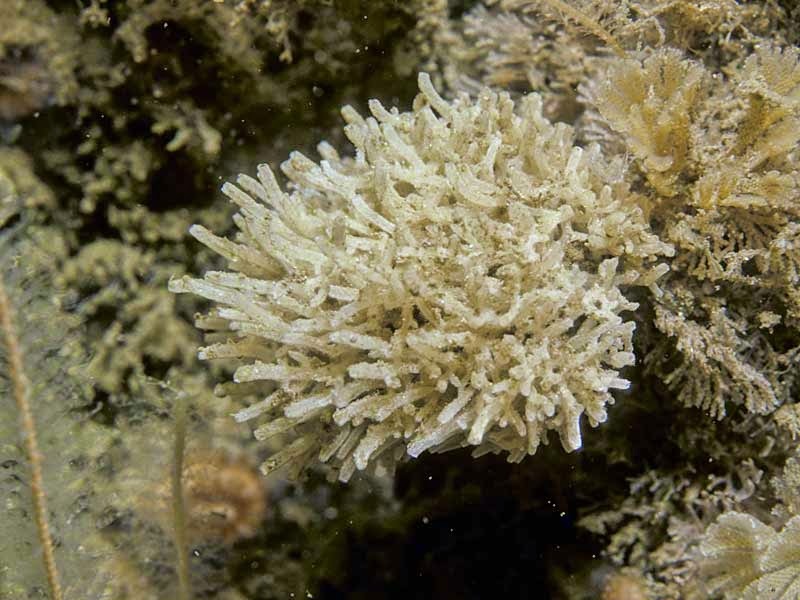 Calcarea, the calcareous sponges, is a group of sponges characterised by the possession of calcitic spicules secreted intercellularly within an organic sheath, and the absence of distinct microscleres (Botting & Butterfield 2005). [BJ06] Barnich, R., & D. Janussen. 2006. Die Typen und Typoide des Naturmuseums Senckenberg, Nr. 86. Type catalogue of the Porifera in the collections of the Senckenberg Museum in Frankfurt am Main, Germany. Senckenbergiana Biologica 86 (2): 127-144. [BB05] Botting, J. P. & N. J. Butterfield. 2005. Reconstructing early sponge relationships by using the Burgess Shale fossil Eiffelia globosa, Walcott. Proceedings of the National Academy of Sciences of the USA 102: 1554-1559. [C-SC03] Cavalier-Smith, T., & E. E.-Y. Chao. 2003. Phylogeny of Choanozoa, Apusozoa, and other Protozoa and early eukaryote megaevolution. Journal of Molecular Evolution 56: 540-563. [CM98] Conway Morris, S. 1998. The Crucible of Creation. Oxford University Press: Oxford. [EL11] Erwin, D. H., M. Laflamme, S. M. Tweedt, E. A. Sperling, D. Pisani & K. J. Peterson. 2011. The Cambrian conundrum: early divergence and later ecological success in the early history of animals. Science 334: 1091-1097. [FV09] Fromont, J. & M. A. Vanderklift. 2009. Porifera (sponges) of Mermaid, Scott and Seringapatam Reefs, north Western Australia. Records of the Western Australian Museum Supplement 77: 89-103. [F79] Fry, W. G. 1979. Taxonomy, the individual and the sponge. In Biology and Systematics of Colonial Organisms (G. Larwood & B. R. Rosen, eds) pp. 49-80. Academic Press: London. [H04] Haeckel, E. 1899-1904. Kunstformen der Natur. Bibliographisches Institut: Leipzig und Wien. [ME94] Maybury, C. A., & K. R. Evans. 1994. Pennsylvanian phylloid algae interpreted as shallow-water xenophyophores. Lethaia 27: 29-33. [T10] Taylor, T. G. 1910. The Archaeocyathinae from the Cambrian of South Australia with an account of the morphology and affinities of the whole class. Memoirs of the Royal Society of South Australia 2 (2): 55-188.